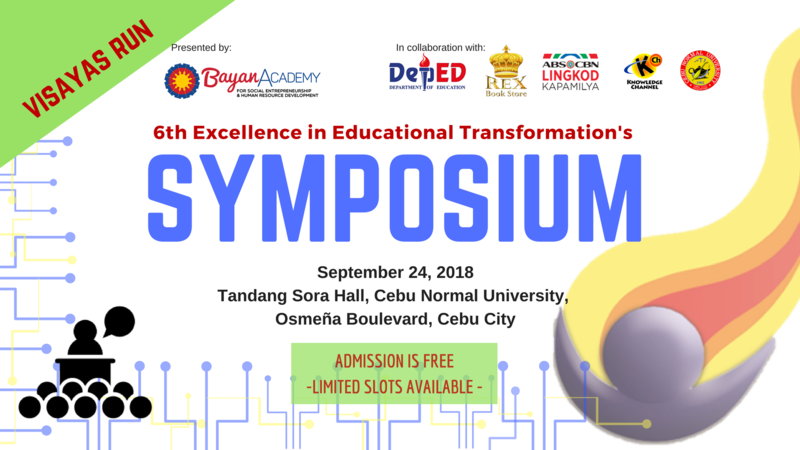 We are pleased to invite you to the Bayan Academy’s Excellence in Educational Transformation Symposium in Visayas. This activity is part of the Excellence in Educational Transformation Awards (EETA) which is in collaboration with the Department of Education, Rex Book Store, Knowledge Channel Foundation and ABS-CBN Lingkod Kapamilya Foundation. How many slots per school? How do we register? Is it for free? Please register here: https://goo.gl/forms/6iPaaOcI657i5aQv1 . The symposium is free of charge. How do we know if we are part of the list of attendees? The EETA Symposium secretariat will notify you via email as soon as we receive your registration. For more information, you can inquire at (02) 927-9365 or (02) 426-3140 and look for Ms. Zaida Villanueva.